From the perspective of the person using an industrial scale, one of the most important concerns is the difficulty of manually placing items onto and off of the scale platform. It is obvious that the lower the profile of the scale, the easier it will be to load and unload it by hand. If the height of the platform is too great, it will be more difficult to perform this procedure. There are many circumstances where the electronic scale will be loaded with a fork lift. In this case, the height of the platform is of no concern. Similarly, if a motorized pallet jack is used for loading, there is no additional effort placed on the scale operator. But in this case, the ramp needed for a scale with a higher platform will be longer than that used for a lower platform. It will also be more expensive. Many platform scales with capacities of 1000 pounds, or even more, are constructed with a single load cell. The load cell is the electro-mechanical device which measures the force being applied from the scale platform and develops an electrical signal that is proportional to this force. Additional electronics within the scale measure the electrical signal and convert it into a digital number, and the process and display the value of weight. If just a single load cell is used, it must be placed in the center of the digital scale platform. It must be both wide and tall, so that when loads are placed on the platform in a way that is not well centered, the load cell and the platform will not tilt over to one side. It must be able to resist side and torsional loads. Therefore the result is a scale with a fairly small platform, but with more height than would be desired. Typical scales of this type may have platform heights of six inches, or even more. One way to achieve a lower platform height is to use four load cells, with one in each corner of the scale platform. Although load cells are among the highest cost components of an industrial scale, the benefit to the user can be considerable. High quality platform scales, such as those produced by Arlyn Scales, use this method. Now, it does not matter where the load is placed on the scale platform. The load will be shared between the four load cells. The signals coming from each of the cells is combined to provide a total weight value. Since there are now minimal side loads, the load cells may be much smaller, with a much lower profile. It is not unusual to find scales of this type with heights in the range of three inches. Another way to reduce the scale height even further is to choose a good material for fabricating the load cell. A very popular choice is aluminum. It is relatively inexpensive, and is easy to machine into the desired shape. The commonly used alloys have good temperature characteristics. When comparing aluminum to stainless steel, it is quite strong when compared to its weight. But for any specified thickness of material, it is the stainless steel that will be stronger. This can be seen when comparing the modulus of elasticity of the two materials. Therefore, for any specified capacity, a load cell fabricated from stainless steel can be considerably smaller than one fabricated from aluminum. This, in turn, will allow the height of the scale platform to be reduced. 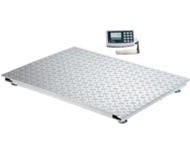 Again, high quality low profile platform scales from Arlyn Scales exclusively use stainless steel load cells. Of course there are a number of other desirable features to enhance the use of electronic scales. The digital display should be large, with good contrast, and should be easy to read. One of the best choices is a graphics liquid crystal display. These have the added benefit of showing higher contrast in high ambient light conditions. This can be particularly useful when the platform scales are used outdoors. Others types of enhancements are the communication capabilities of the industrial scale. While an operator may directly use the data shown on the display, it may also be important to print this data or store it in a database. Some common communication standards often found on electronic scales include RS-232 Serial ports, Universal Serial Bus, and Ethernet.